The 4‑H National Youth Science Day preview event was a fun-filled day of activity. We started the day with a private tour of the HughesNet offices in Germantown, Maryland, where we learned about the recent developments and launching of the Gen5 satellite. We were able to peer into their secret world full of computer monitors, where the HughesNet team works around the clock monitoring the reach of their global service. They have real-time interactive maps showing the connectivity and level of service at any given moment. It was incredible to see how far reaching their network extends, and how they continually monitor its progress. I would never have imagined the magnitude of the size of their satellite if it were not for the photos documenting its construction on the wall. Following the tour, students from the D.C. and Maryland area 4‑H clubs came to the HughesNet facility to experience the preview of the newest 4‑H NYSD project, Incredible Wearables, first hand. This event provides an opportunity for 4‑H to test the Beta version of the year’s challenge. At the start of the event, I presented a general overview of the curriculum, and then we dove into the project kit. The Incredible Wearable project will be the 10th 4‑H National Youth Science Day project hosted by National 4‑H. This year’s project is a fun way to learn about the components that go into making a fitness tracker. The challenge involves building a health monitor with four constraints: size, aesthetics, available components, and time. The goal of the challenge is for youth to apply the engineering design process by analyzing their creation and figuring out ways to refine the design to meet the project constraints. The challenge started out by teaching the youth how to find their pulse and determine the average for their group. From there we started in on the build process. As with any beta trial run, you will discover things that could be improved or refined. This was the case for not only the youth but for those of us running the event as well. We worked through the challenges, and in the end were successful at getting all the devices powered up and communicating with a mobile device. All of the feedback was collected by 4‑H to improve the devices and provide guidance for 4‑H members across the country on how to prepare for 4‑H NYSD events. All of the youth teams were able to take their monitor outside where they could have some space to move around. They jumped rope, hula hooped and did jumping jacks to increase their heart rate. The tracker recorded the data and sent it to their mobile device. It was great to see all the youth participating and creating the tracker as a team. They had very different ideas of how to attach the components and were quite creative. One team even made a glove out of felt that worked incredibly well. This experience helped me to see just how much goes into to creating a project, such as Incredible Wearables. While I have lead 4‑H NYSD curriculum prior to this, I did not give much thought into what it takes to create a project that will be educational, fun, and successful for a large group of youth. 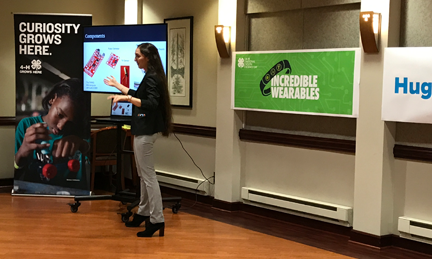 The Incredible Wearables project, while a bit difficult to get started, turned out to be a big success that was enjoyed by all. I am grateful to National 4‑H for all the magnificent opportunities I have had so far and am looking forward to the 4‑H NYSD event on October 4th in New York.